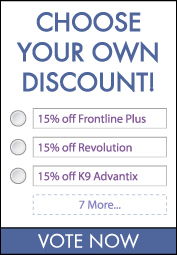 CanadaVet.com Blog: Choose your own discount! For our second promotion of our December celebrations for reaching over 1000 Facebook friends, we want to give you the choice of what exclusive discount you receive! All you have to do is vote for the product that you would most like to receive a discount on and if it is the first one to reach 100 votes then you will receive a voucher to redeem your discount. Once the winning product has been decided you will then have 1 week to take advantage of the offer so make sure you follow it closely! Make sure that your chosen discount wins and get your friends and family to vote too. Click here to vote for your discount.